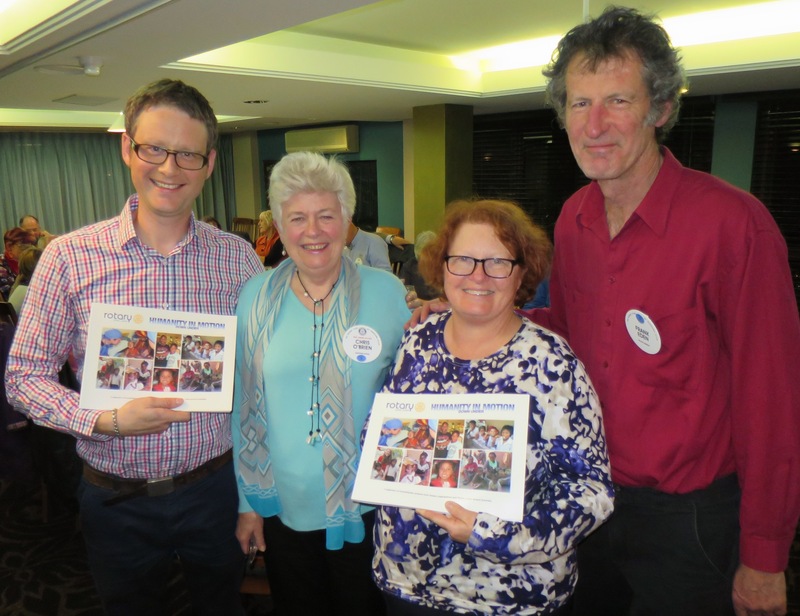 August 2016 – Narooma Rotary Club Inc.
What a great night on Thursday with Charmaine outlining the work she , Sharon and her RAWCS team accomplished in Cambodia. It just shows that, with determination and grit, a lot can be achieved. It also demonstrates for us that, with a little effort from us in fundraising, we can support such tremendous work by such a dedicated and hard working member of our Club. Whew, the whale tickets have been sold in record time. Hopefully members can attend on SATURDAY 3 rd SEPTEMBER at 12.30 at the Wharf to show Norm our appreciation for his generous donation. Unfortunately I can’t be there, but I hope many can show the flag for Rotary and Norm, and join in the excitement of finding out the winner of the prize. Next week is our Club Assembly and it is your opportunity to show how THINKING OUTSIDE THE SQUARE can advance the work of our club and present your ideas for our fun night on 15th September. The crazier the idea the better. I suspect a NIGHT TIME SWIM AT BAR BEACH is not on anyone’s list. PITY! 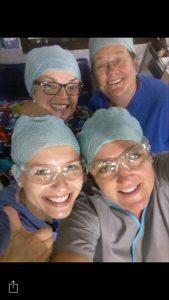 Guests: Sharon White (pictured left), Julie Davis (pictured left) & Steve Benick (Narooma Dental), Roz Wood (Chris O’Brien), Merinda (Bob Antill), Iris (Frank Eden). Spot the Error: Last week’s intentional error was missed by Angie so jackpots for next week. 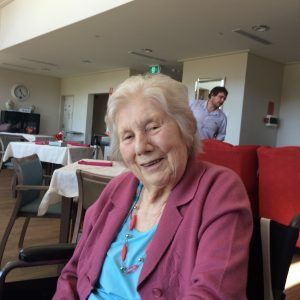 NEW Wine for Seniors – I kid you not…..Clare Valley vintners in South Australia, which primarily produce Pinot Blanc, Pinot Noir, and Pinot Grigio wines, have developed a new hybrid grape that acts as an anti-diuretic. It is expected to reduce the number of trips older people have to make to the bathroom during the night. 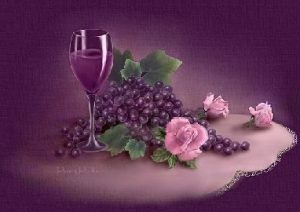 The new wine will be marketed as PINOT MORE! Sorry I HEARD IT THROUGH THE GRAPEVINE!! What a meeting we had this week. Georgia Poyner, a 15 year old Narooma High School student, kept us spell bound for about an hour on her free diving, scuba diving, photography, triathlons, spearfishing, drawing and much more . Her pictures of the sharks, in particular, brought back memories of scuba diving at South West Rocks among the sharks and so I can well understand her love of what she sees metres below in our oceans. Just listening and seeing all that she did in the last 12 months was amazing and to top it off she is helping to research our marine environment as a volunteer. Now wonder Rotary emphasises the need for more and more youth programs. As I write Sandra Doyle is in Canberra at the Model United Nations Assembly (MUNA) with students from Narooma High School – Paris Blessington, Lilly Burgess, Shaina Woodard and Cyann Vlatovic. They are representing the Phillipines and we know they will gain a great deal from the experience. Last night (Friday) Donna & I attended the Quota Trivia night at the Narooma Club in support of So Art. Laurelle was also there but I did not see any other Rotarians, but, as I am woeful at Trivia, I was not looking too hard. However one piece of Rotary news was that we have two applicants for Rotary Youth Program of Enrichment. More work for Sandra who is doing a sterling job with our Youth program. Today (Saturday), thanks to the efforts of Frank and Iris this morning, we sold all our Whale tickets. While I hate selling tickets, it really is a good public relations exercise as you get a good chance to engage with the public and let them know what Rotarians are trying to do in and outside their community. You might note I have not used an acronym . I sent an email today to Sandra with a misspelling of an acronym but, unlike Peter’s and Bob’s excuse last Thursday, it was not deliberate to catch out whether she actually noticed the mistake. I have an admission to make. I had to look up what the acronym for Rotary Youth Program of Enrichment actually meant to make sure I had it right. For me at least it means I am definitely Outside the Square as all these acronyms baffle and annoy me. Birthday: Hon. member Pam Rayner PHF celebrates her 91st birthday on 1st September. 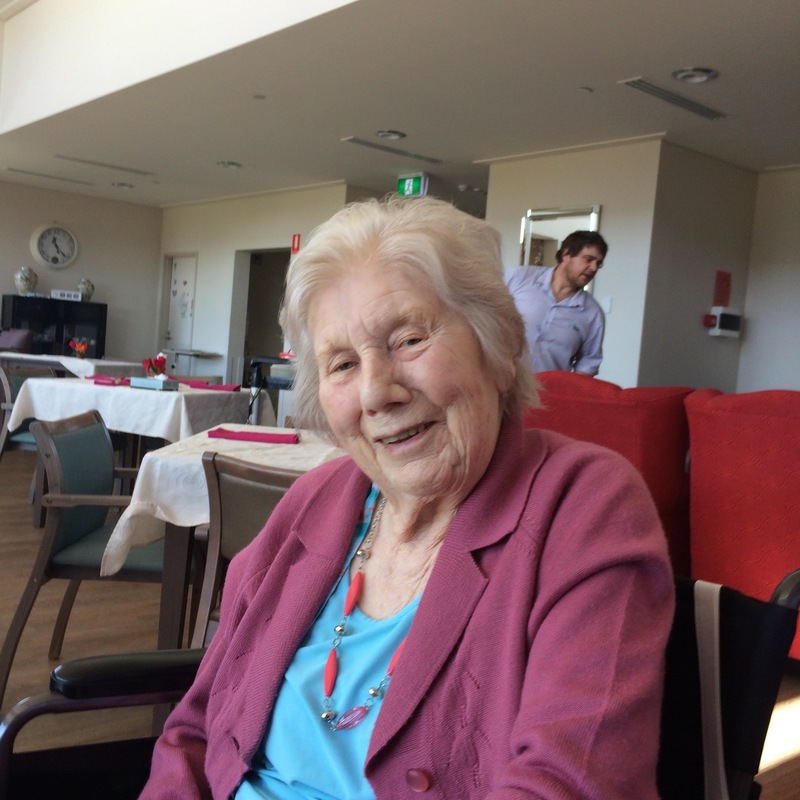 As Rotary is her only family in Narooma, any members who can drop into Estia, Dalmeny to wish her well would be great. Returning a little early from an interstate trip to see his team play at the MCG, a bloke sees the car of his wife’s boss in the driveway. Suspecting an affair, he asks the cabby if he would be a witness. The cabby agrees, in return for $100. Together, they go through the back door, creep up the stairs, and into the bedroom. And … sure enough. Switching on the lights, the bloke yanks the blanket back and there they are, naked! The husband puts a gun to the naked man’s head. A beautiful but cool ( 15 degrees) swim this morning but sadly the only Rotarian to be outside the square this morning. Taking up Peter Bull’s suggestion of toasting an overseas club as our International toast, last Thursday we toasted the Rotary Club of Dun Laoghaire , my hometown in Ireland. They appeared chuffed by the toast and they will toast us on the 8th September. We had a great talk from Annette and Paul from Southcoast Health and Sustainability Alliance and it tied in beautifully with Frank’s idea of hosting a Solar Expo ably supported by his committee. Whale ticket selling is going well as we have sold 23 books so far. Thanks to Ang for a remarkable 11 books sold. Hopefully those who have books of tickets to sell are well on the way to completion. Please put on your thinking caps as we are hoping to have a fun night for our meeting on the 8th September so please let me know what you think we might try out. 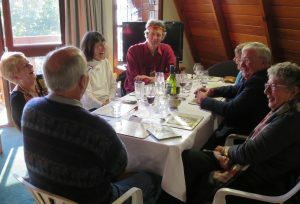 Last Thursday 12 members were present, 5 guests also joined us for the meeting and fellowship, they included Chris’ guest Joan Morgan, Iris the partner of Frank, Annette Kennewell, our guest speaker and her partner and Paul Dolphin who was also a part of the Southcoast Health and Sustainability Alliance (SHaSA). Peter Bull gave an interesting 3-minute talk about his grandfather, practically about his involvement in the First World War and the battle of the Somme. Peter’s grandfather wasn’t at the front line, his role was in the Pioneers, building roads, bridges and tunnels. Peter told a great yarn of a tunnelling exercise that just happened break ground near a Frenchman’s wine cellar! Peter also told the story of his visit to the Somme and the impact it had on him. 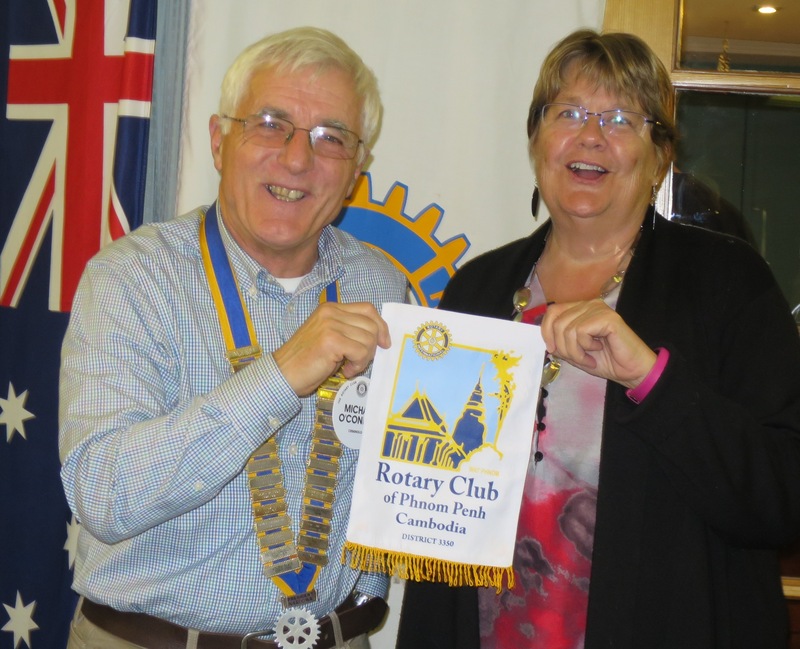 Our guest speakers were Annette Kennewell and Paul Dolphin from SHaSA. Annette told us how SHaSA came about – the initial idea was to investigate how power bills could be reduced for those on low incomes or renting a house by putting solar panels on their roofs. The Alliance received a $50 000.00 grant to carry out a feasibility study. SHaSA has now moved to trying to source solar panels for local homeowners through a bulk buy system. The idea is that the Alliance can get a better price through a bulk buy system and a tender process. To date the Alliance has received more than 270 expressions of interest. If you want more information visit the website (www.shasa.com.au) or read the article by the mayor in last week’s Narooma News. Paul spoke about other opportunities for renewable energy including solar farms and community renewal investment funds. He also spoke about the inevitability of climate change and the need to adapt to new forms of energy sooner, rather than later. Don’t forget the Whale Watching raffle – Michael needs assistance to sell the tickets. To date Angie has sold 10 books! Well done Angie. Volunteers are needed for the next market – please go online and fill out the roster. Organisation for the Renewables Expo continues, Frank and the committee are doing a great job pulling it altogether – don’t forget help will be needed. Dying to Know Expo – see attached flyer. 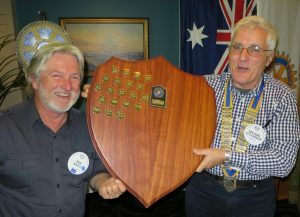 Pres Michael & PP Bob holding the Cinders Trophy – Sweet Victory! Peter Bull fessed up to putting unleaded in the Mazda (yep it’s a diesel!) – the happy moment was that no damage was done to the motor. Mike Young relayed his home renovation successes (?) and Bob told us about a nasty scare with his daughter (the happy moment is that all seems well) and Chris told us that her daughter was returning form an overseas holiday. Laurelle won the lemons, however, she knocked them back saying that she had too many already, Bob Antill ended up being the lucky winner. For her trouble Laurelle won the honour of serving the port. Peter Bull took home the wine. 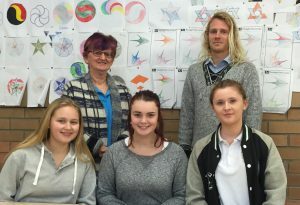 Narooma High’s team for MUNA is Paris Blessington, left front, Lilly Burgess and Shania Woodard, with mentors Narooma Rotarian Sandra Doyle, back left and Narooma High teacher Lachlan Reilly. Cyann Vlatovic was not available for the photo. Our Youth director Sandra Doyle is off to Canberra this weekend with the Narooma High team for the annual Model United Nations Assembly (MUNA), along with students from 27 other schools from the eastern states. MUNA provides students with the extraordinary experience of contributing to a United Nations General Assembly style debate in Old Parliament House. The Rotary Club of Canberra Sunrise organises it with support from the Australian National University (ANU), while our Club is sponsoring the Narooma team. Sandra and teacher Lachlan Reilly have been helping Paris Blessington, Lilly Burgess, Shania Woodard and Cyann Vlatovic prepare for the weekend. ‘Our team will represent the Philippines so over recent weeks they’ve been busy gaining an understanding of the Philippines’ history, politics, economics and particular stance on world affairs,’ she said.. This is the third time Narooma High has fielded a team, thanks to the combined efforts of Angie, David and Rachel, Lynda and now Sandra. 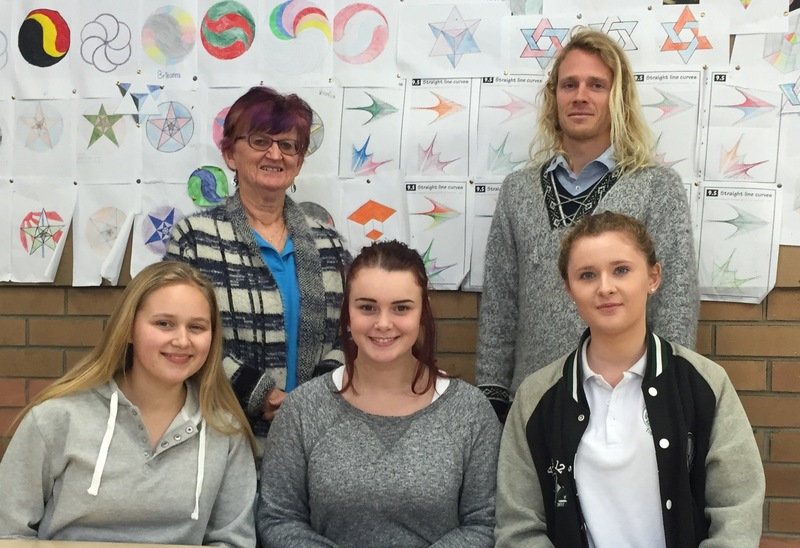 The students’ experience last year led to a debating club being established at Narooma High. Students will visit the ANU and also join diplomats from the countries they represent at a dinner on Saturday night. Other south coast schools taking part in this year’s MUNA are Batemans Bay and Moruya High Schools, St Peters at Broulee, and Lumen Christi at Pambula Beach. Remember the pieces of paper I distributed with a rectangle labelled the status quo and a heading Let the Ideas Flow? Only 3 members have returned them so far and after the Club Assembly last week there are lots of ideas out there, so please give me your ideas. I felt that it was a productive meeting and special thanks to Peter Bull stepping into the shoes of Bob Aston when he is away as editor of the Beacon. It is inevitable that we will need members to take on roles at short notice and the way Bob organised Peter to step in was great and it left one less job for me to try and find someone to take on the task. THIS IS DELEGATION AT ITS BEST, when I don’t have to delegate because if it comes suddenly into my lap then it is inevitable that I will be left holding the problem. I loved Peter’s suggestion that we resurrect an old approach to International toasts, that is we toast an overseas Club then contact them to tell them that we have toasted their Club at our meeting. It will hopefully foster some interesting links/news. Thinking outside the STATUS QUO does not necessarily mean something new, but it can be something old that can be brought back in. It is your Beacon and so please contribute. One idea that did come up that we could have member profiles and Bob Antill has generously offered his professional skills in taking portraits of member sometime in the future to be with the profiles. Members might also like to contribute to the Beacon why they volunteer, what got them into volunteering or even a Rotary moment. Jokes, obviously subject to the editor’s knife, can even be sent in. Special Thanks should go to Frank and his committee who are doing sterling work organising the Renewable Energy Expo. It is a significant task and if good ideas are generated that increase the workload of the committee members should volunteer to help out to reduce the demands placed on individual committee members. This was well illustrated when Chris offered her assistance to help organise a more formal arrangement for dinner on the night of the expo. Finally, an update on the recent Christmas in July fundraiser takings have now jumped to $1645.37. Wow! What an effort from one Narooma Rotary Meeting, I hope by April I will have plenty of dollar signs in my eyes when I set out on the Bibullmun track. How can you make your Rotary club multi-dimensional? 14 Members and 1 guest (Iris) were at last week’s meeting. As Michael has indicated it was Club Assembly and Board meeting night. Items for discussion at the Assembly ranged from the Beacon and International Toasts to the Renewals Expo and Rotary Park. This week Annette Kennewell is our guest speaker. Annette is from the South Coast Health and Sustainability Alliance (SHaSA), a not-for-profit group based in Eurobodalla who help to make renewable energy more accessible and more affordable. According to their Facebook page South Coast Health and Sustainability Alliance SHaSA are a group of volunteers born from the People’s Climate Picnic held in Sept 2013 in Moruya NSW. They are currently working on a project to install rooftop solar power to low incomes houses in the Eurobodalla. Please encourage friends and to come along to the meeting. 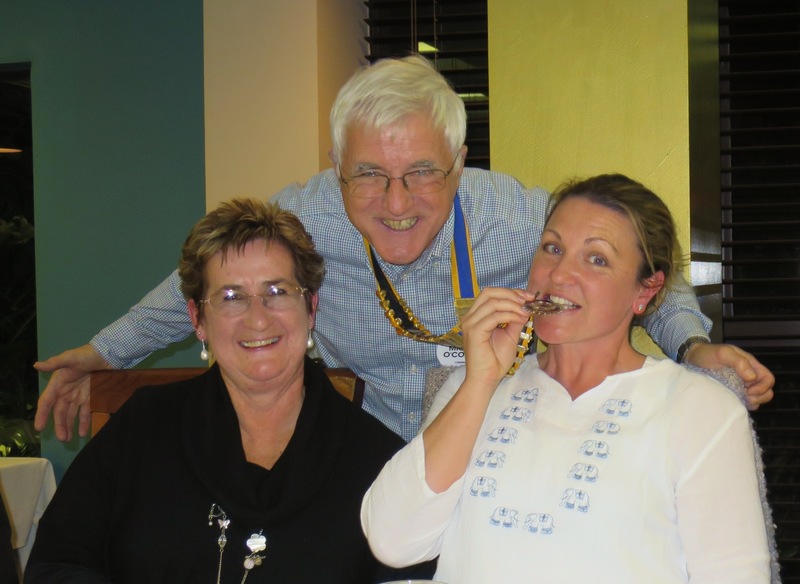 All members know that Charmaine is an outstanding Rotarian contributing to our Club in many ways, such as helping Michael at our recent Christmas in July event. We also know that she contributes beyond our town and country as a volunteer assisting those less fortunate than us in her chosen vocation of dentistry. Below is a YouTube clip that Charmaine has sent me outlining the excellent work done by Rotarians and others in East Timor to ensure that young people get the best dental care possible. Let’s make sure we continue to support Charmaine in her efforts. We also know that Charmaine is the very proud mother of Liz Cherry who is a singer and performer with the Australian Army Reserve. As most of you know Liz has performed at many sporting and cultural events representing the armed forces, most recently she had the honour of performing the French and Australian National Anthems at the centenary commemorations at Pozieres. Charmaine was there to witness this moving event. Below is a short clip of Liz’s performance. These glorious insults are from an era “before” the English language got boiled down to 4-letter words. A member of Parliament to Disraeli: “Sir, you will either die on the gallows or of some unspeakable disease.” That depends, Sir,” said Disraeli, “whether I embrace your policies or your mistress. Last Tuesday Sandra Doyle, Chris O’Brien and myself attended Quota’s Student of the Year with our own Bob Antill being one of the judges of the competition. It was a difficult task as all students performed brilliantly and it was sad in one way that there had to be a winner. On Sunday we had our Christmas in July fundraiser which raised a fantastic $1405.00 to start our Club’s fundraising for my 1000km walk next April. Donna and I were delighted to have so many at our home and by all accounts the food went down a treat. I was asked by a few to post my recipe for the turkey stuffing. I will try but I really don’t have a recipe as I just go with the basics and then add what I feel like is right for that day. I can’t give you quantities as I simply don’t measure anything! Herbs/spices, (I usually go to the cupboard and start looking at the containers and usually just pick what moves me at the time but it would usually have oregano, Tuscan seasoning, Italian herbs, cardamom, Garam masala, five spice, cracked pepper and some, very little, sea salt). I always vary what I use and sometimes I might put in a bit of chilli and Moroccan seasoning if I want to add some bite, this time I restrained myself and left them out of the mix. Tip – When you make breadcrumbs you can always freeze what you don’t use. I usua lly make too much and by freezing the leftovers there is no there is no need to throw away what hasn’t been used. I will make breadcrumbs when we have a loaf of bread that is going stale, putting them in the freezer for later use. I hope that helps those who asked. A number liked the ham sauce which was only Dijon mustard and maple syrup. Again the recipe I started with had far too much Dijon, so I had to keep adding maple syrup to make it a little less hot. (Not everyone is like me who likes hot English mustard on his ham). The great thing about this sauce there is no cooking. Have a great week and I look forward to our Assembly this Thursday and hopefully you will have matters you want discussed or issues you are not happy with. 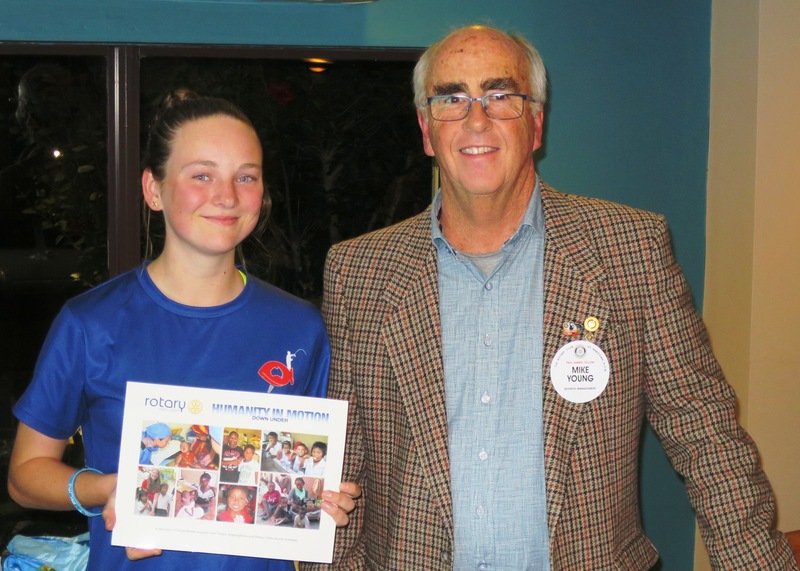 Please click HERE to view – download the ‘Rotary On The Move’ Newsletter for August 2016. There is a great article from the Woden Daybreak Club about attracting and keeping new members. 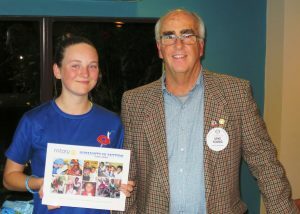 To learn a little about one Rotarian’s efforts to end Polio click here. 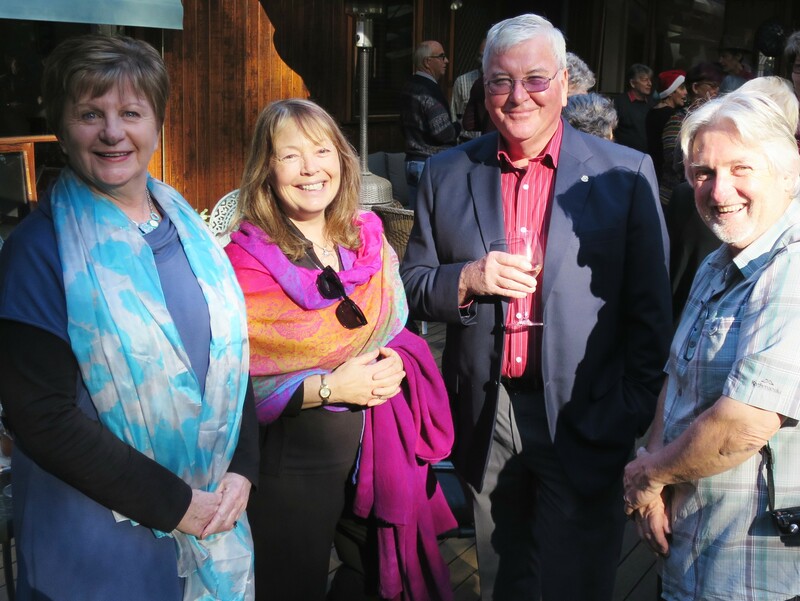 27 Members and guests descended on Michael and Donna’s place on Sunday 31 July for a Christmas in July fundraising event. The weather was great and the food, wine and company outstanding. For main course we were treated to some expertly cooked ham and turkey with roast potatoes and pumpkin – we even had Brussel sprouts, some even put their hand up for seconds. Unfortunately, Therese and I had to leave before the plum putting was rolled out, however, I understand it scored a 10 out of 10. As Michael indicated over $1400.00 was raised – A great effort. This Thursday we are back at the Whale for a club assembly and board meeting. If members have items to raise at the assembly, please let Michael know well before the meeting. Don’t forget Chris has organised an interesting speaker for 11 August. Annette Kennewell from the South Coast Health and Sustainability Alliance (SHASA), a not-for-profit group based in Eurobodalla who help to make renewable energy more accessible and more affordable. SHASA is coordinating a solar bulk buy for the Eurobodalla community. Please encourage friends and guests to come along to the meeting. This collection of 20 newspaper headlines will have you giggling at the English language – and perhaps at the lost art of copyediting. Jennifer and Jose live in different sections of their town but go to the same school. Jennifer left for school ten minutes before Jose and they met in the park. When they met, who was closer to school?